The Social Contract is the third act of the Moderation(s) project to be held at Spring, following the teaser event Guilty Pleasures by Ang Song Ming (August 2012), Incidents of Travel by Latitudes (January 2013) and A Fictional Residency (June 2013). **We regret that no one under 18 years old will be able to sign the contract to enter the room due to issues of legal majority. 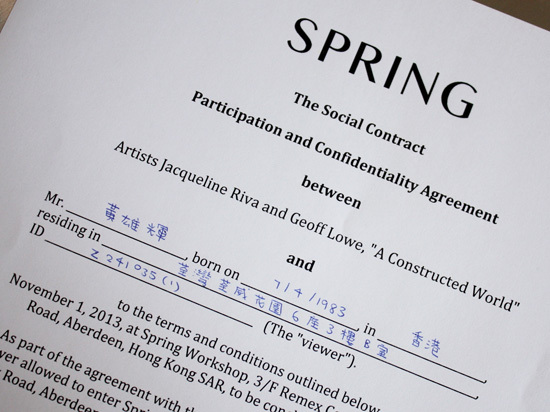 Spring Workshop, A Constructed World and Heman Chong would like to extend special thanks to Roger Ouk, who wrote about his thoughts on creating the contract for ArtAsiaPacific here. 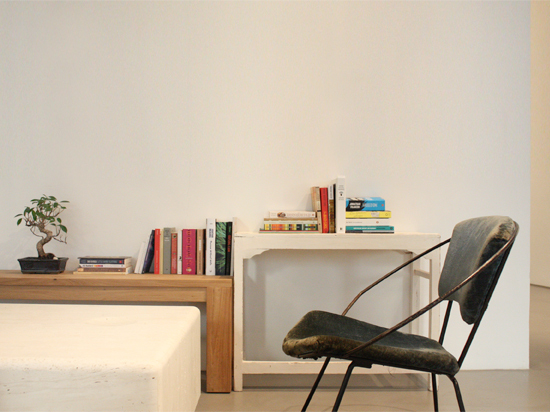 A Constructed World is represented by Solang Production Paris Brussels. Moderation(s) is an ongoing collaboration that will unfold in 2013/4 between Spring Workshop, Hong Kong, and Witte de With, Rotterdam. Conceived as an anthology of active proposals, Moderation(s) brings together an international group of artists, curators and writers in a year-long program of contemporary discourse and production between the two organisations. Within this framework, the artist Heman Chong will steer the project which will involve more than 50 artists and engender a conference, three exhibitions, three residencies and a book of short stories. Please click here to read more about the program.